Beloved, my beloved. This was his tattoo. He actually got it when he met one of the first loves of his life (not me). She inspired him. Something about their hanging out together. And traveling. 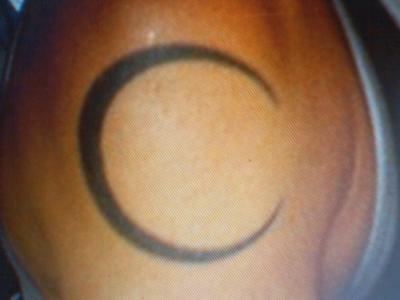 And his inspiration by the half moon. I thought it was poetic, and poignant all at once. Always anothers presence always present. Decorating his arm as if to say "she is always out there. He served time with her. Earned his stripes. Her love is there." Yes, I know there is enough room for all of us. I know it truly.